Bucks legend Ryan Young believes the current set of AFC Telford players can become legends in their own right. The Bucks head to Hereford FC in the FA Cup first round tomorrow, emulating what Young and his team-mates did back in 2008 when they faced Southend United at this stage, writes Richard Scott. Young said: “I don’t know the current set of players well but what I do know is that they have got to believe in themselves and believe in the club that they will go a long way because Telford is a sleeping giant, it’s a big sleeping giant. “It just needs a little bit of guidance to get them on the right path. They had an indifferent start to the season but are starting to come together and in the FA Cup, they have a tough game at Hereford. “But it’s a winnable game which could put them into the second round and keep the club ticking along. When Young left the club in 2014 they had just been promoted to the Conference thanks to winning the National League North under Liam Watson, but their stay was brief as they were relegated after just one season in the top flight of non-league football. 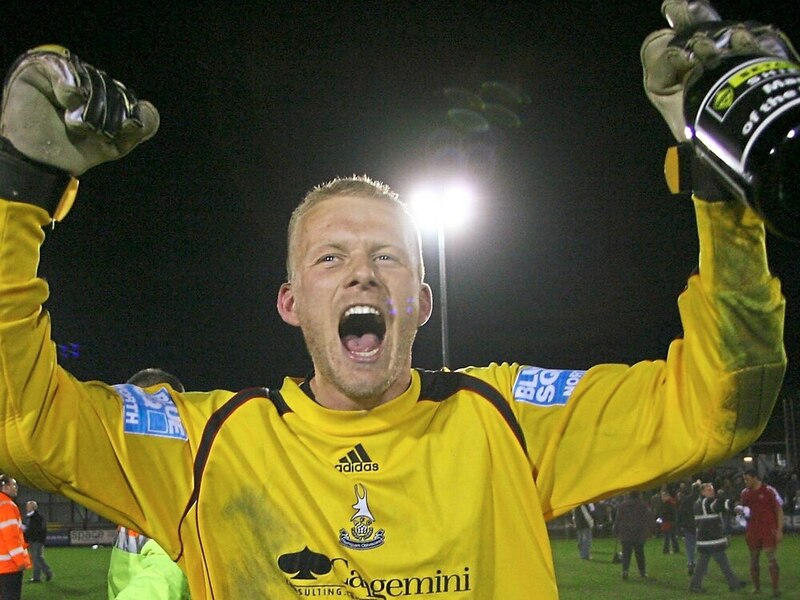 The former Hednesford goalkeeper believes the New Bucks Head side can return to that division. Young said: “I think they will get back into the National League one day, but it’s a tough road. "If I’m honest they deserve to be in the Conference Premier playing the big sides. "Nothing against the teams in the National League North, but they need to be playing the likes of Tranmere Rovers as it will help attract the big crowds. Young relocated to the Isle of Wight but continued to ply his trade on the mainland, with Havant and Waterlooville being his new club where he continues to keep goal. With the Hawkes doing well in the National League South and the Bucks in the North, the two sides could meet in the National League, prompting a reunion with Bucks. Young hasn’t ruled it out. He said: “I’ve always wanted a return to the New Bucks Head, I’ve always wanted to play against Telford. “I don’t know about on the day, I might be a little bit emotional. At Havant and Waterlooville, we are doing quite well. “We are ninth in the league table at the minute and we think that we have a good chance of getting into the play-offs or going up automatically. “But age isn’t on my side, I’m 37 nearly 38. We will have to see how long my body will last. Telford will be without full-back Ryan Wilson tomorrow as he is cup-tied, having played for Matlock Town in the competition earlier this season. Skipper Shane Sutton (knee) and Jordan Lussey (groin) could return to action.